The G2W Institute’s Ecumenical Forum for Faith, Religion and Society in East and West is a specialist research institution dedicated to ecumenical matters and the Eastern Churches. The Institute is run by the G2W society, the Swiss Churches and a number of partners abroad. G2W’s aim is to promote dialogue between East and West and to represent the interests of socially disadvantaged groups and individuals in Eastern Europe. The institute publishes the monthly specialist journal Religion & Society in East and West, supports social projects and serves as a consultant on questions concerning the coexistence of European religious cultures. 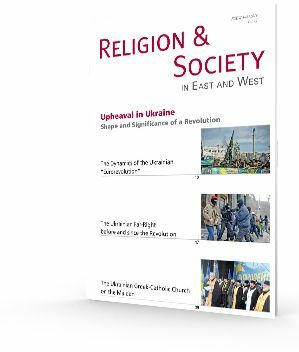 Religion & Society in East and West provides information in German on current affairs and events related to the Churches and religious communities in Eastern, Central Eastern and South-eastern Europe, with a particular focus on ecumenical and interfaith dialogue. Useful background information is also provided by analysis of political, societal and cultural developments in the individual countries of Eastern Europe. • In the news: the latest on Church affairs, religious communities and society. Drawing its contributors from the Church, academia and journalism, Religion & Society in East and West is committed to a pluralist approach to reporting that aims to foster understanding between East and West. Accessible but scholarly, Religion & Society in East and West is written for a broad and educated readership interested in the situation of the Churches and religious societies of our Eastern neighbours. It is read throughout the German-speaking world by scholars, people involved in interfaith dialogue and people interested in international developments. From time to time we publish special issues in English language (e.g. RSEW 7-8/2013 "Black Sea Issue"; RSEW 5-6/2014 "Upheaval in Ukraine", RSEW 9-10/2016 "Illiberal and authoritarian tendencies in Eastern Europe"). The G2W institute’s collaboration in the field of development is based on three principles: exchange on an equal footing with our project partners, long-term engagement and ecumenical openness. Our project partners in Eastern Europe and in the Middle East include both religious and non-religious organisations. G2W’s development work is mainly focused on Russia. In order to guarantee efficient and sustainable development for individual projects we are in permanent close exchange with project leaders on the ground, many of whom are women. A large part of the work is performed by volunteers, whose commitment sends a message of Christian solidarity with people who are socially vulnerable. We offer reliable support for our project partners in the long term so that model structures do not lose their financial basis overnight. While Russia is a heavyweight in the field of international politics and presents itself as a global player, the country’s needs in the field of development remain immense despite a twenty-five-year transformation process. The UN thus considers Russia neither a developed nor a developing country; the World Bank places Russia beneath the newly industrialised countries. Alongside a new middle class, the majority of Russia’s population lives in precarious circumstances, particularly in the regions far from the centres of Moscow and St. Petersburg. These precarious living conditions are compounded by the dysfunctional nature of the state social systems. Corruption is rife throughout Russia and is a serious problem in the fields of social services and healthcare, since adequate care is only available to those who are financially well situated. Civil society initiatives are hampered for many reasons in Russia; the state offers more obstacles than support, in the Russian Orthodox Church social services remain in a state of development, and the majority of the population has no interest in voluntary work. The initiatives G2W supports set an example for civil society characterised by solidarity. In the wake of the restrictive law on non-commercial organisations in Russia of 2012 our partners are in need of greater support than ever.